inrng : friends in high places? Alexander Kolobnev has been in Russia since he tested positive in the Tour de France. We’ve not heard much more. Under the anti-doping rules the deadline for his hearing has expired and the Russian cycling authorities risk a fine for any more delays. Certainly the UCI seems keen to remove him from the sport. Scroll through the rankings and there’s a mystery man on 30 points. The double asterisk and the 30 points belong to Kolobnev. He’s on hold for now it seems, in a form of limbo until a proper verdict appears from the Russian authorities. (oddly, or perhaps kindly, the late Xavi Tondo is still in the rankings). The boss of Katusha team just happens to be the President of Russian Cycling, a certain Igor Makarov. He’s also Chairman of its lead sponsor, the gas giant Itera (aka Итера). Itera and Makarov are big supporters of cycling and fund the European Cycling Union, a sort of subdivision of the UCI made up of the powerful European cycling federations. But if you think that’s a potential support for Kolobnev, hold on. Far from being the black sheep of Russian sport for bringing disgrace during the middle of the Tour de France… Kolobnev was recently given a special award by none other than President Dmitry Medvedev. The cyclist is now a “Knight of the Order” thanks to his “services to the motherland“. 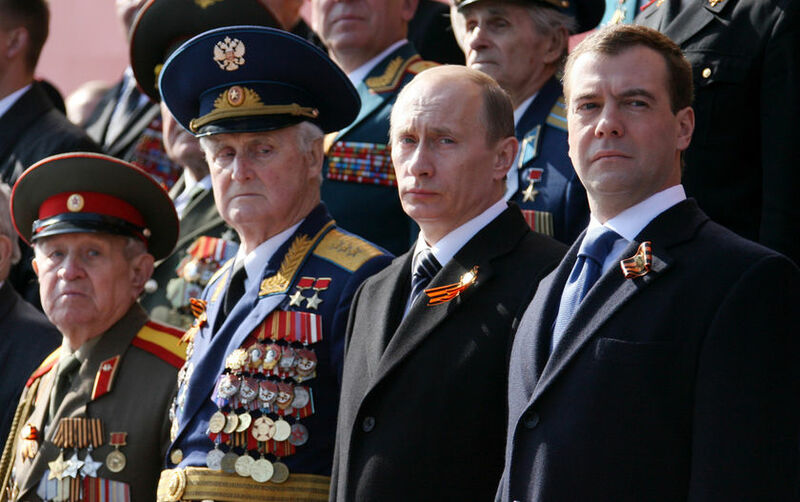 If the Russian head of state celebrates a rider in public then good luck to the authorities who try to prosecute him. In soviet Russia, EPO does you! This sport is a joke. As more and more teams are funded by national federations and funded by wealthy oligarchs and robber barons, this is going to become more and more commonplace. I hate to think I am about ready to turn my back on this sport, and stop paying attention, but as more and more evidence leads me to believe that the future is not Garmin-Cervelo or HTC, but more Katusha and Astana. @ColoradoGoat: You can still pay attention to the sport, enjoy the races and be cognizant of the fact that the UCI is corrupt, that most riders dope (all gc contenders for sure) and that, all in all, the sport is pretty much a cesspool. (Yes, there are a few exceptions). I always wonder why folks think being a “fan” of cycling means they have to tell the world how clean it is, how things are “getting better all the time” (like the song), etc, etc… Who actually believes this stuff besides the pr folks for teams and riders, the laywers for Alberto, the ASO sponsored media [I guess that means cyclocosm now! ;-)] and the clowns at VS? Let’s all try to admire and enjoy the sport without being delusional about the integrity of its participants, especially its financial backers and the UCI. If not, we aren’t really any better than the professional liars who run this show, now are we? This could blow up into an interesting test. The crew behind Katusha are powerful. The UCI took Ullrich to court because the Swiss failed to act and we’ll see how fast the UCI want the Russians to act. This is my first full year of following pro cycling, and I had never before realised the power of National Sporting Federations in managing these issues, I always naively assumed that there would be an international body to oversee all international sports and sportspeople. I think that this just underlines the fact that when sporting ideals and financial / political interests get mixed together, its a bit like oil and water..you end up with a nasty slick. Good post. Let’s keep track of this. Sorry – before anyone asks, yes, that was supposed to be in jest. I realise though that it might be a little too accurate to be funny…? Oliver indeed I stopped being outraged some time ago about doping, I just watch racing for enjoyment an entertainment as long as it’s exciting that’s all that matters to me. and so it goes and has gone for a long time. It’s the not giving a f%&k part and the watching for entertainment only attitude that actually makes us just as responsible. This is our sport not only theirs! I know I cant control the Russians but I can do my part where I am right now. We are not going to ever solve doping at the top end of the sport, NEVER. It starts with us as a society and our responsibility and influence can run as far and the U23 ranks, where the real doping begins. From there you need the secret password, billions and a proven medical record to go any further. That’s today, but it wasn’t always like that. We get too sucked into the professional end of the sport on a frenzy of passion and twitter jibber jabber. Journalist and bloggers alike are not going to ignite a change (no offense irng) because well, they need professional cycling. They have let us down over the years and looks like it’s happening all over again or really nothing has changed. Pro Cycling is simply too small of a culture in a big world and there is still only 1 true grit with balls, Paul Kimmage. Make doping taboo within your own society and make any young lad or lass understand that to dope means to be a criminal. It’s has to become a major political issue in every country, every district and that is where the real pressure will come from, Mummy and Daddy with a vote to protect their children and the future of our society. In the meantime yeah lets be entertained by the professional circus as it travels from town to town all over the world but dont forget how their corruptive ways will eventually effect you and your family. If a 50 year old master is caught using epo, how will taking the piss out of Contador on twitter help change that? 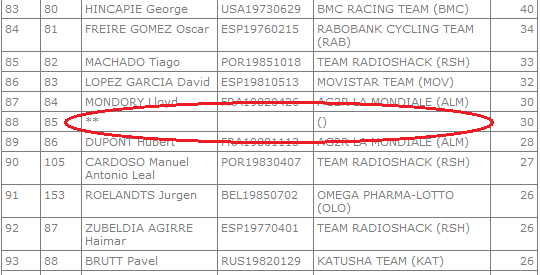 Oliver claims “most riders dope (all gc contenders for sure)” This is EXACTLY why this problem continues. Every doper believes this to be true so he/she must dope too, just to “level the playing field” as they say. You insult the clean guys with this kind of claim. Sanctioning needs to be taken away from the national federations as they’ve proven time and again unable to do this fairly. The question is WHO should take it over? It’s obvious the UCI can’t be trusted either and the wait to go through all the moves and countermoves to end up at CAS a year or more after the positive test just makes the entire sport look like a joke. We need a common procedure – test positive, make your claim of innocence within a short time period (15-30 days?) then someone (maybe the same folks who look at the bio-passports and decide who to sanction?) has another short time period (15-30 days?) to render their decision. You appeal (naturally) to CAS and this gets heard and settled in say, 30-60 days. Lifetime ban from the sport unless you rat-out EVERYONE else involved, which might reduce your penalty to two or four years. All the folks you ratted out get the same procedure and penalties. You agree to this when you sign up for a license. Don’t like it? Find another sport! If everyone IS doping, the level of corruption that implies is insane. Is this really that big of a surprise?? Let’s be honest, the Spanish federation have been doing the same thing for years now. Look at the handling of the Contador case!! As for ColoradoGoat, no one is forcing you to watch or participate in cycling. I reject your statement that most riders still dope. The evidence all points towards it becoming much cleaner recently. Point in case is the much slower climbing times at the tour that the times produced during the ‘EPO era’. If you hate the sport that much do everyone a favour and take up darts. Previous post: Green Edge in World Tour?